Does your dog need a holiday? Dog friendly self catering on the Gower may be just what the vet ordered! As the clocks spring forward and the daffodils are coaxed into the sunshine then a walk along a Welsh beach will blow the cobwebs away and wake you up for the summer. 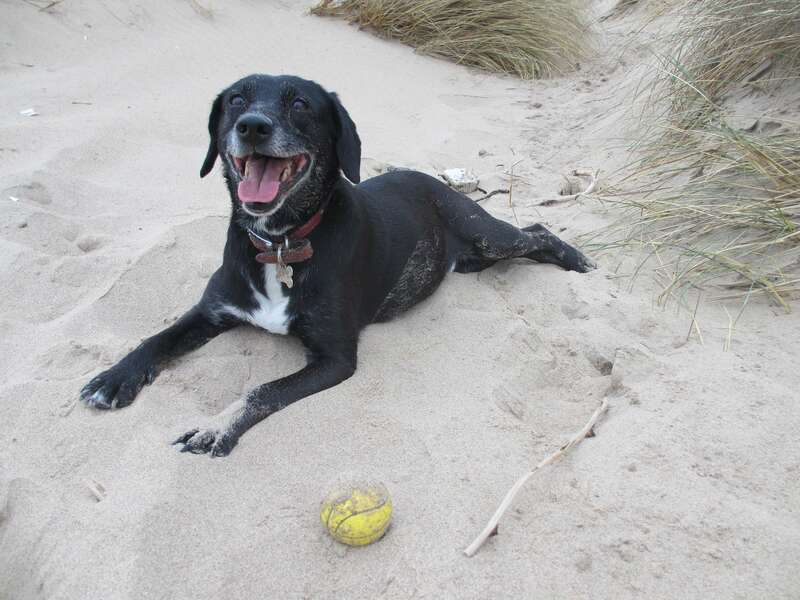 A large number of the beaches around Swansea Bay and the Gower remain dog friendly all year, but if you grab a late availability break before May 1st then you can avoid the dog ban all together. There is also a warm welcome for furry visitors in many attractions and pubs in the area. Beautiful Singleton Park and Clyne Gardens in the heart of Swansea, together with a number of lesser known green spaces around the area, will give additional options for exercise and of course you can access the Gower section of the newly opened Wales Coast Path if you want to put in some serious mileage. Gower Edge enjoys welcoming multiple dogs and other pets. Rush (above) has tested the facilities for us, and Mum brings her dog, Bracken on occasion too. 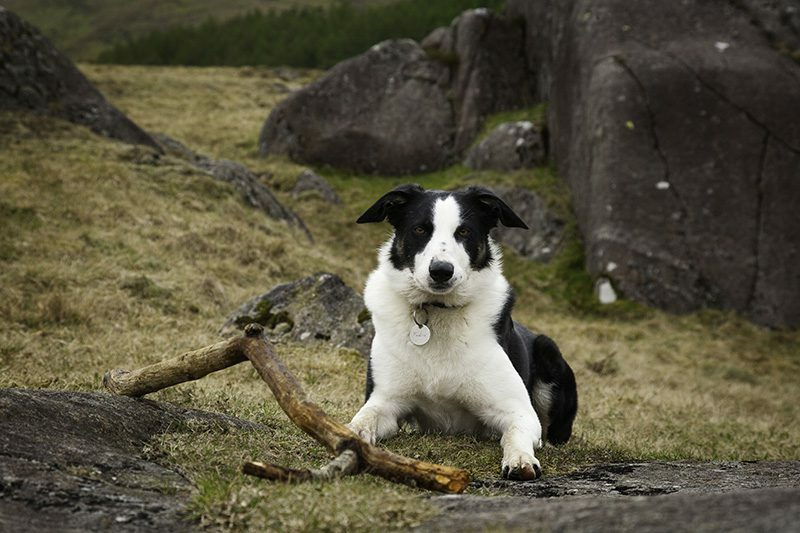 You do need to be aware that livestock graze freely in a number of areas on the Gower itself and an extending lead will support safe walking, keeping pets well under control. We have suggested a route to visit Arthur’s Stone to get you started. If you are looking for dog friendly accommodation, check out our prices and availability HERE and perhaps we will see you soon. Happy walkies! Sylvia Mawby owns and runs Gower Edge with Louise. The house used to be the family home until a move to the Midlands for work, when the decision was taken to run it as a holiday let. Sylvia is a serial dog owner but has many friends with more than one dog. She knows how difficult it can be to find holiday accommodation for multiple dogs. Hopefully this pet friendly home from home will fit the bill for you. We have finally got round to enjoying Gower Edge ourselves this week with a pre-Easter visit and the decision had already been taken that our first target would be a walk down to Mumbles on arrival to check out The Pilot, which has recently won new accolades as the best pub in Wales. Having dropped off our kit in Dunvant, we took to the bike path from Dunvant Square to Blackpill and were soon reminiscing about happy days walking our children around Clyne Valley Country Park in a back pack (they are now 20 and 18)! The birds provided a tuneful backdrop and we were soon out of earshot of traffic and feeling the stresses of the week recede into the background. Rush was full of enthusiasm for the new scents and made several new Welsh doggie friends along the way. We noticed a few welcome additions to the route. There is now a bike hire facility at Dunvant Rugby Club (Bike Ability Wales) and a short time later we came upon a BMX cycling track just behind the Railway Inn in Killay. Our kids would have loved having this on their doorstep and I guess you can hire a bike and then go down and give it a try. Having made it to the front at Blackpill, and now walking into a brisk headwind, we set our sights on the Pier and lighthouse and traced out the sweep of the bay along the promenade. We could see the Mumbles restaurant scene has a few new additions and all the favourites remain. We debated whether to eat out but decided to stick with the “drink and home” plan as we had the dog with us. 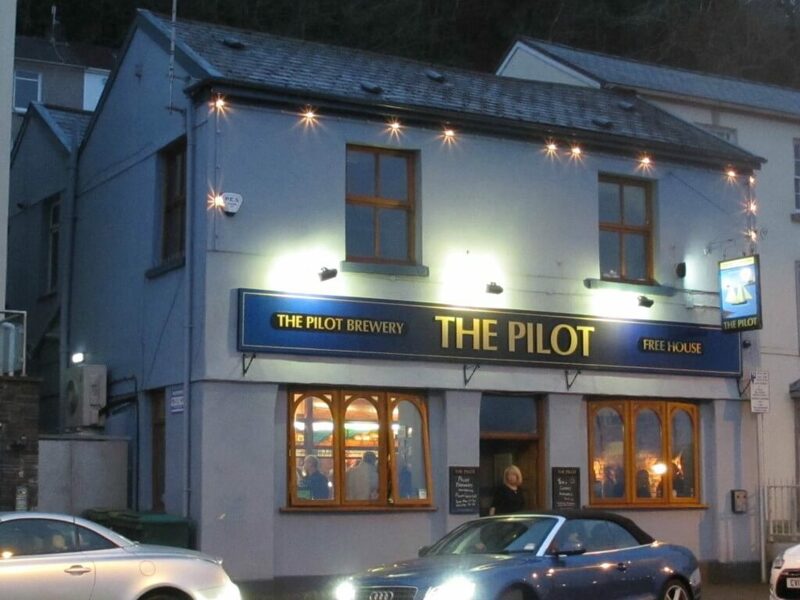 The Pilot was looking great in it’s new coat of blue paint and is pet friendly, but was filling up quickly. As Rush prefers a quieter atmosphere we had a coffee and slice of cake at Verdi’s across the road (where dogs are allowed outside under cover), making a mental note to return for a craft pint another day. 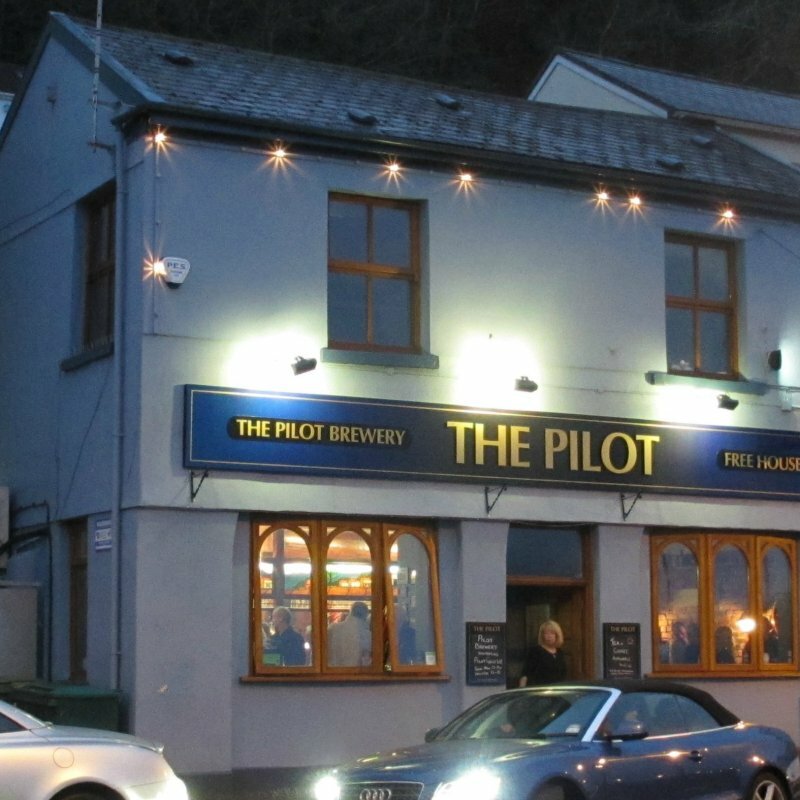 The Pilot, Mumbles – dog friendly. Dusk was falling and the recently refurbished Oystermouth Castle was lit up and looking good against the skyline as we came back into Mumbles. Joggers and cyclists shared the promenade with us back to Blackpill where we turned left onto the cycle track again. We noticed what we had assumed were reflective tabs in the cycle path on the way down were now giving out a faint glow in the dark which kept us happily on track through the woods. Great idea! Fish and chips from The China Kitchen in Dunvant was tasty as always (great curry sauce!) all washed down with a nice red wine. Arrival complete and ideas bandied around for the rest of the stay we retired, satisfied, to bed. We own Gower Edge, a pet friendly self catering home from home on the edge of the Gower Peninsula in Dunvant. If you would like to stay in the area, check us out, we’d love to hear from you. 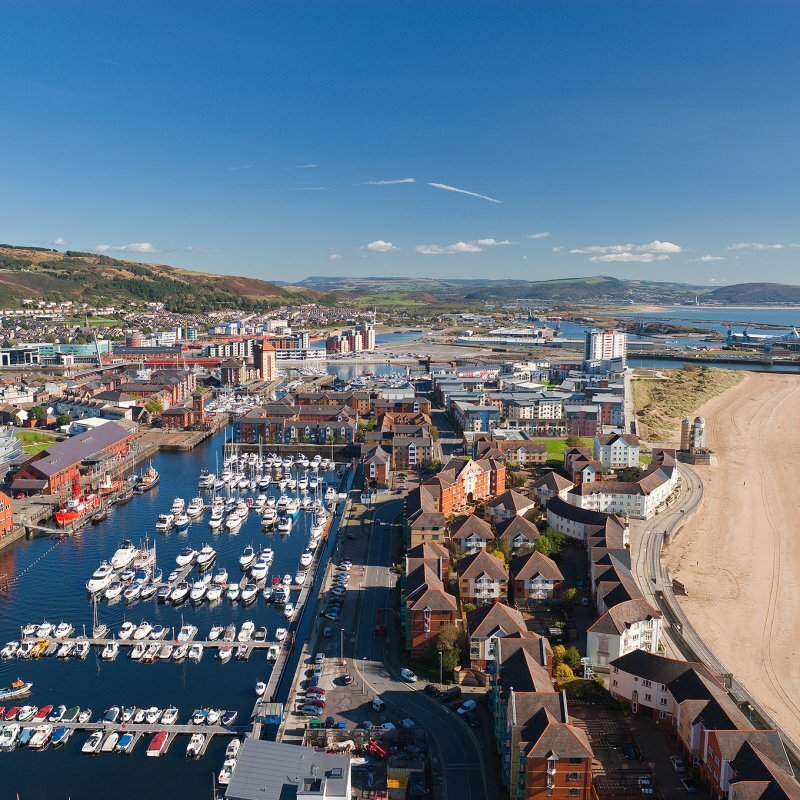 Swansea Marina – move over Monte Carlo! Swansea Bay is gaining a reputation as a great place for a short break or family getaway at any time of year and the photograph below shows clearly how the description of a city by the sea is fully appropriate. Swansea Marina basin complements the promenade, housing a number of high profile buildings such as the LC2 leisure centre, the National Waterfront Museum, and most recently the Grape and Olive restaurant at the top of the highest tower in Wales boasting views both across Swansea Bay and further across the Gower itself. Swansea is proud of its heritage as the copper mining capital of the world, but is not afraid to move forward and make the most of its prime waterfront location when welcoming the increasing number of visitors who arrive ready to enjoy both the city itself and the nearby beautiful Gower coastline. 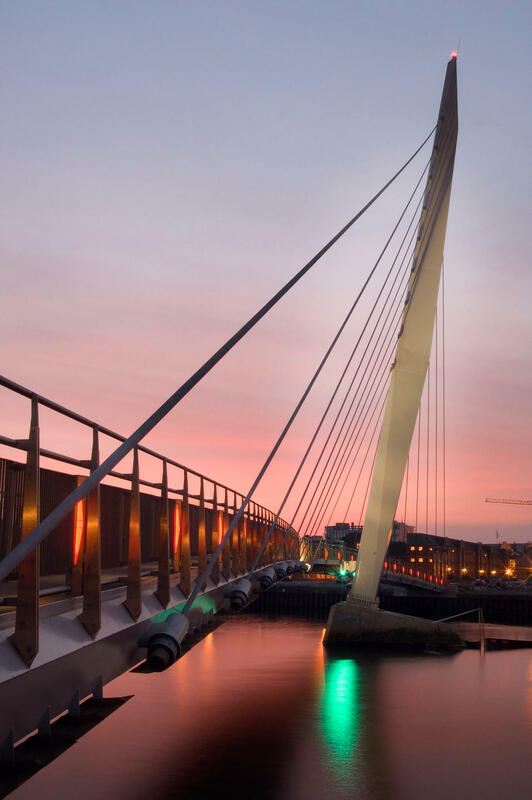 Both business and leisure are skilfully catered for and the integration of walking and cycle routes along the front and up into town make for a leisurely visit. Dylan Thomas is famous for naming Swansea an “ugly, lovely town” and anyone who has lived here for a while understands the fondness in these words. 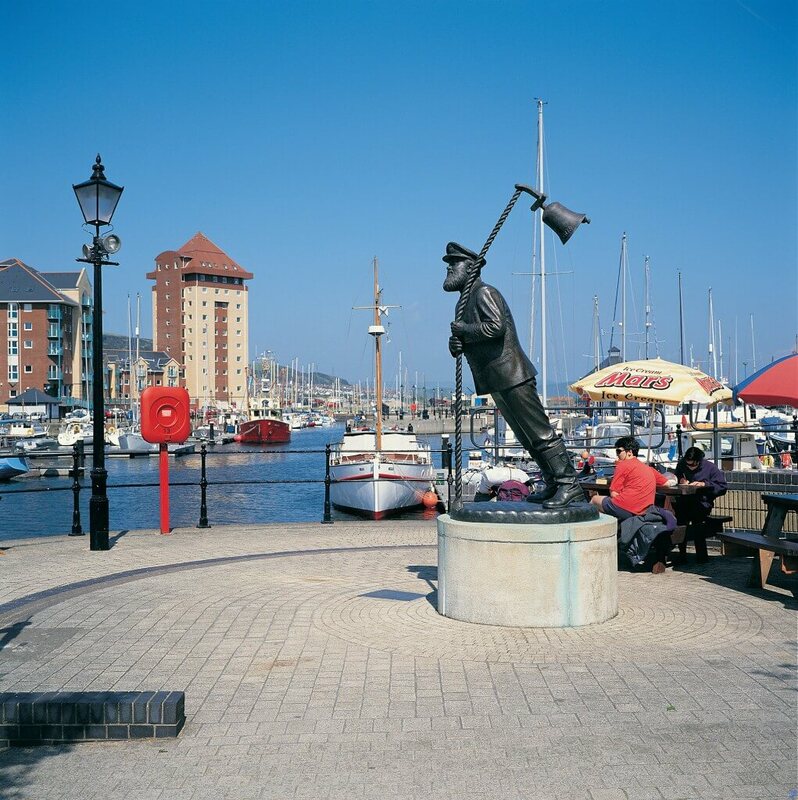 Not known for standing on ceremony, he would hopefully have enjoyed the reminders around the marina, such as the Captain Cat statue above and the Dylan Thomas Centre, which celebrate his association with the city. We don’t take ourselves too seriously here, so take the opportunity to relax and make your own decision about the loveliness around you. The National Waterfront Museum is a marvellous addition to the waterfront and is well worth a visit. 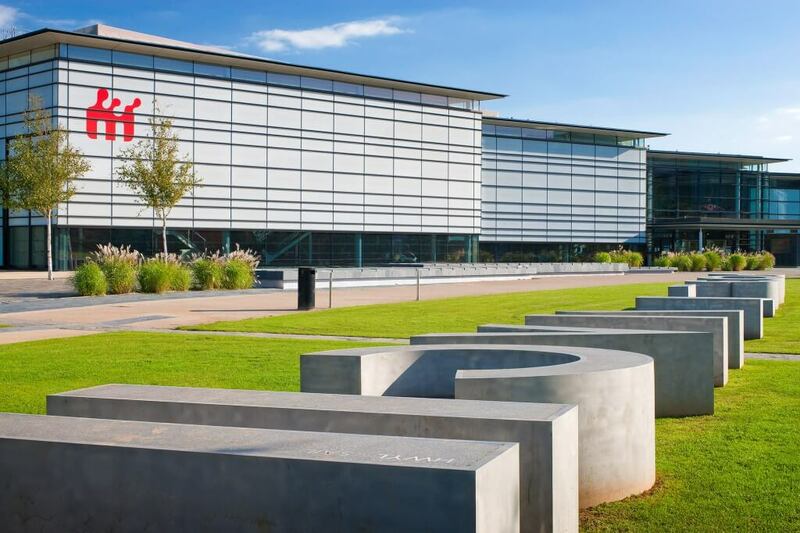 There are regular activity days for children and the young at heart and this is a great place to get to grips with the interactive exhibits, which cover the human history of the area as well as the maritime and industrial heritage. Did I mention entry is free? 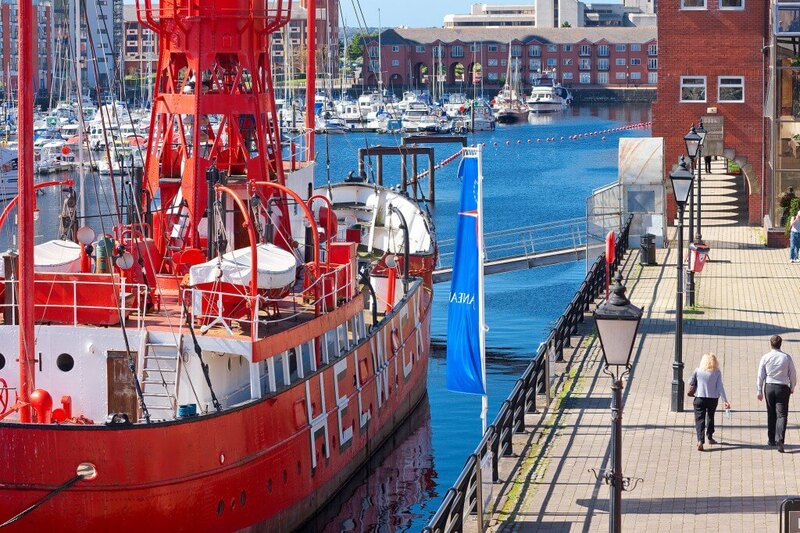 An interesting glimpse into the past is given by a visit to the Helwick lightship, now moored in Swansea marina basin and part of the National Waterfront Museum exhibits. Our children used to love clambering around the iron staircases, and there is a different view of the Swansea Marina from the upper deck. When you have soaked up enough history you will be ready to hit the leisure centre, the second building in this position, hence the name. 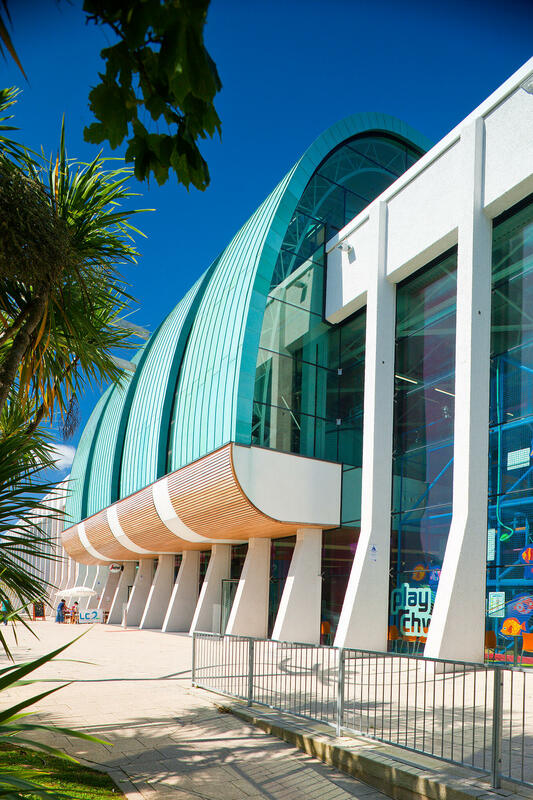 Here you will find Wales’ biggest indoor water park, with slides numerous pools and a wave machine. Uniquely you can try your luck at surfing on the wave rider, and there is a climbing wall (separately!) if you still need to let off steam. 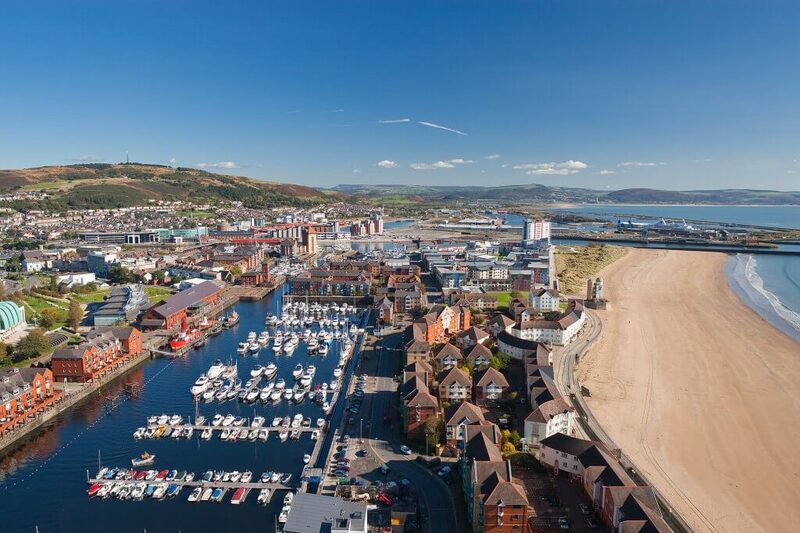 Add to this the numerous art galleries and restaurants nestling about the place, two more excellent museums and the choice of a beach or promenade stroll to finish off your visit and I hope you will agree that Swansea Marina deserves a place on your holiday bucket list. If you are looking for a place to stay during your visit, then of course we hope you will consider Gower Edge for your self-catering needs – we look forward to welcoming you soon!